Dog & Cat walking leads for daily use and outdoor adventures. Extendable leads, stretch leads, waterproof and lead solutions for running with your pet. The Front Range Leash is a strong, lightweight dog lead for a comfortable walking experience with your best friend. For adventurous humans and companions alike - a robust and secure dog lead. Add visibility to your evening dog walks with this high visibility LED pet leash. Hip belt and leash for use with a four legged partner from Ruffwear. The Ruffwear Double Tracker can instantly transform any lead into a two-dog walking system. A quick and simple to set up tension dog hitching system. The Roamer Leash is a versatile walking and running dog lead with a section of stretch webbing to absorb every step. Keep a short lead integrated into your dogs existing collar for a hands free dog walk with the option of restraint at a moments notice. The Mountain Paws Double Dog Extension Lead allows two dogs to be walked on the same lead. 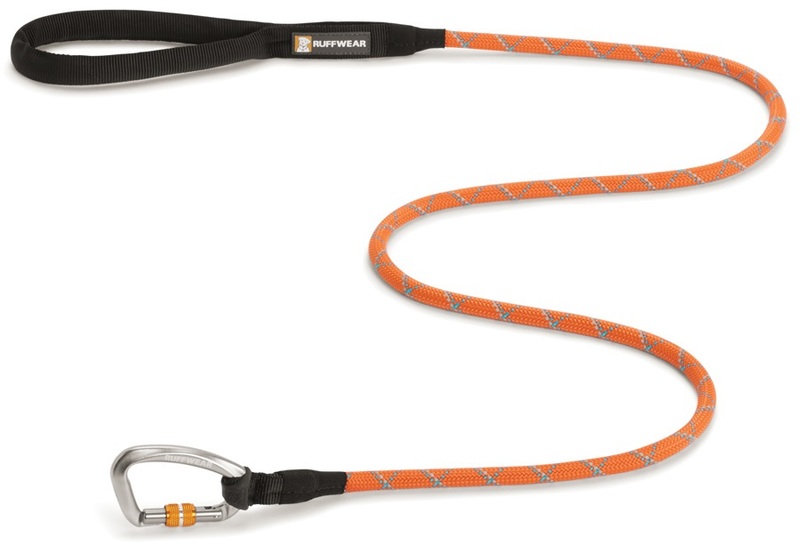 Robust reflective dog lead with a secure locking carabiner, a climber's dog's dream.